Sherman Miles was born on December 5, 1882 in Washington DC. His father was Lieutenant General Nelson Appleton, a Civil War Union Major General, and his mother was Mary Sherman Miles. Years passed, and at 26-years-old, Miles married Yulee Noble on November 24, 1909. They had a happy family with two kids: Nanita Yulee Miles Wight, and Nelson Appleton Miles. In 1905 Miles graduated from West Point, an acclaimed military academy. Also in this year he became a Second Lieutenant. Eventually he would become a Major General, but this wasn't for years to come. He went to the Army War College in 1921-1922, and in 1926-1927 he attended the Command and General Staff School. Miles performed a variety of different jobs including participating in the cavalry, coast artillery, field artillery, and on the General Staff. 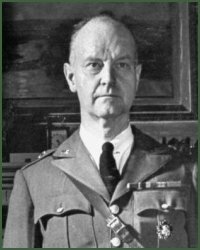 In 1912-1940 Sherman Miles served as a military attache, a military expert sent on diplomatic missions, to various locations in Europe. In 1922-1925, Miles went to Ankara as an attache. He acted as the Assistant Chief of Staff Hawaiian Department in 1929-1932. He served again as a military attache in 1940-1942, this time to London and Dublin. In 1940, Miles advanced to the Assistant Chief of Staff G2 US Army. During the Pearl Harbor attack on December 7, 1941, he acted as the Chief of Army Intelligence. In 1942, Sherman Miles became the Commanding General 1st Service Command. Sherman Miles retired in 1946 from the army. In 1947-1950 he became a Member of House Representative of the Massachusetts Legislature. He passed away on October 12, 1966 in his home in Boston, and was buried at the Miles Family Mausoleum in Section 2 of the Arlington National Cemetery. Major General Sherman Miles was a military expert, and had experience in politics. Here is a document that Sherman Miles signed while working as the Assistant Chief of Staff. It used to be confidential, but it was recently made open to the public. It was from Sherman Miles to the Chief of Staff about the situation in Ukraine. The document is dated August 4, 1941, a few months before America entered World War II. It talks about German and Russian troop movements in Ukraine, and can be summarized by "The fate of the Russian armies fighting to the west and southwest of Zinovieks now hangs in the balance." The document was also distributed to important personnel such as the President, Secretary of War, Assistant Secretary of War, Chief of Staff, War Plans Division, and the Office of Naval Intelligence. Another similar document signed by Sherman Miles, addressed to the Chief of Staff talks about the situation in the Mediterranean. This one is dated March 10, 1941, a few months before the first document. The document states that German troops are pushing towards France, and are providing support to Italy. At the end, Sherman Miles summarizes the three effects as reinforcements joining in "French North Africa are greatly diminished", "German occupation of Casablanca and Dakar are somewhat increased", and "France is forced one step closer to the Axis." Yet another document, this time in text, is signed by Sherman Miles and addressed to Chief of Staff. Dated October 17, 1941, just two months or so before America joins the war, the document contains information about Lieutenant General Hideki Tojo. The document is also distributed to other important personnel. Ammentorp, Steen. "Biography of Lieutenant-General Sherman Miles." Generals of World War II. 2009. <http://www.generals.dk/general/Miles/Sherman/USA.html>. "Gen Sherman Miles (1882 - 1966) - Find A Grave Memorial." Find A Grave - Millions of Cemetery Records. 21 Sept. 2009. <http://www.findagrave.com/cgi-bin/fg.cgi?page=gr&GRid=42203106>. Miles, Sherman. Memorandum-Sherman Miles--The Chief of Staff-March 10, 1941. Digital image.Directory of / Http://docs.fdrlibrary.marist.edu. <http://docs.fdrlibrary.marist.edu/psf/box3/a43a01.html>. Miles, Sherman. Sherman Miles - Chief of Staff 8/4/41. Digital image. Directory of /Http://docs.fdrlibrary.marist.edu. <http://docs.fdrlibrary.marist.edu/psf/box5/a61k01.html>. Miles, Sherman. "Japan's New Premier, October 17, 1941." Ibiblio.org - Travel and the Outdoors. Ibiblo. <http://www.ibiblio.org/pha/timeline/411017amie.html>. "Sherman Miles, Major General, United States Army." Arlington National Cemetery Website. Arlington National Cemetery, 27 Feb. 2004. <http://www.arlingtoncemetery.net/shermanm.htm>.